Today its white water rafting day. After lunch we paddle down the Ahansal River "Morocco's Grand Canyon" (class3/4). We start by the Cathedral rock. After safety instructions we practice and float down rapids all day (class3). The route is dotted with rapids crossing an Aleppo pine forest landscape. In a magnificent setting of beautiful river gorges, the Ahansal River allows you an easy, enjoyable rafting trip. 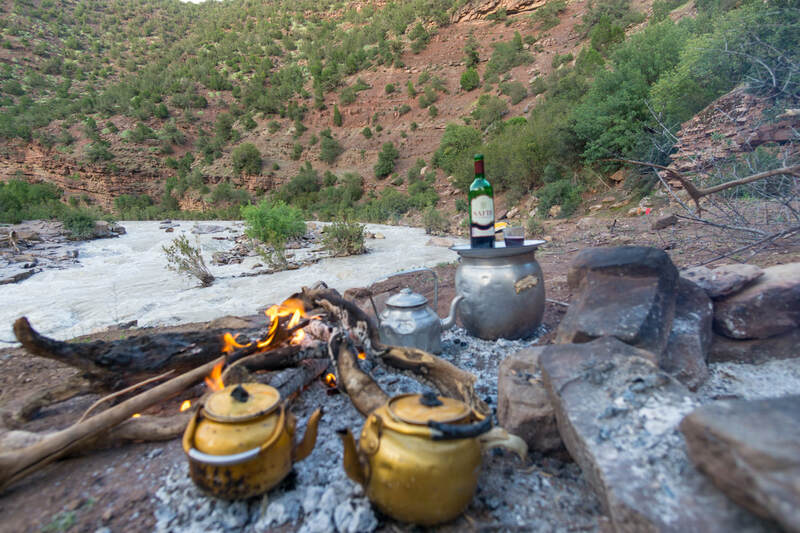 To help you get the most out of your trip, guides are available to give instructions and guidance on navigation.After the biggest rapid (class4) we reach our river campsite where our local team are hosting us with a fresh mint tea. While we are sitting by the fire enjoying the magical surrounding our cooks are preparing a nice meal for the evening. You will sleep under stars like you've never seen before. After breakfast we'll be trekking with mules in the Hidden Atlas with our local guide Momo. You will get the chance to share stories with Berbers in their home with a cup of mint tea. After a long day of walking experiencing the nomadic lifestyle we head back to our river base. 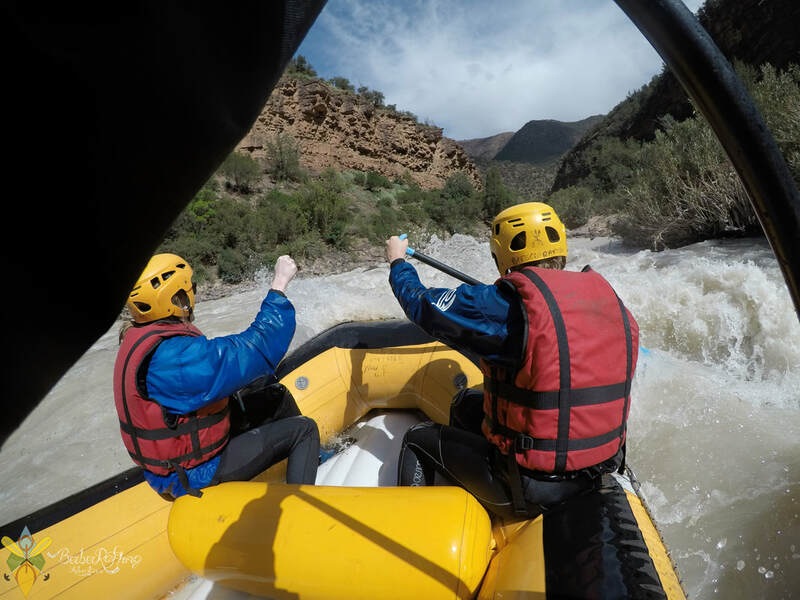 WHAT TO BRING ON YOUR RAFTING TRIP? – 1 set of hut clothing: warm and comfortable, waterproof/windproof jacket, footwear for walking around camp. – Thirst for adventure & sense of humour! The Berber Rafting base at Iminwarg is located 12 km from a little village called Tillouguite 2 hours drive from Ouarouizagt (a town a the lake Ben Ouidane). Simply follow the dirt road up the valley for about 30 minutes (you can ask the locals). 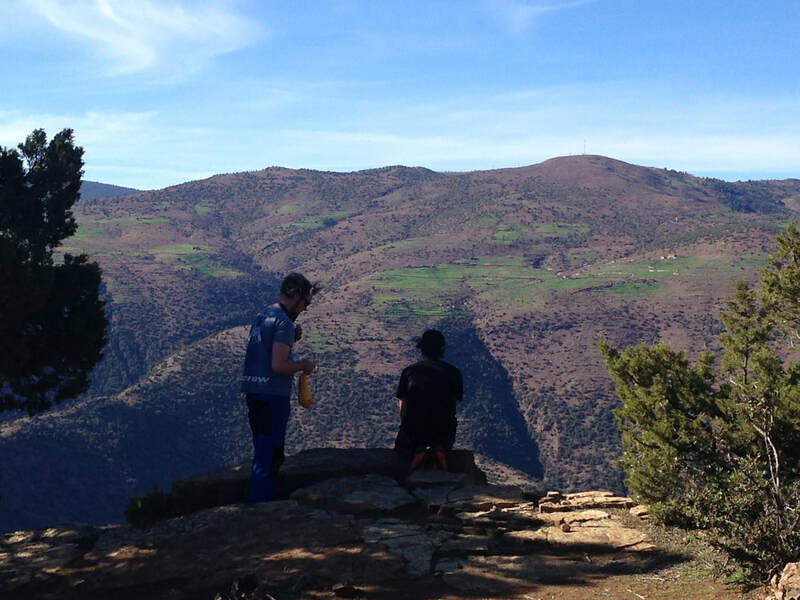 ​FROM Marrakech: Take the road to Fez. After around 1 hour drive there should be a sign "Azilal", turn right. You can do a short stop over at the cascade d'Ouzoud or keep driving towards Azilal. Once you are in Azial, keep driving towards Ouarouizagt. You will see the stunning blue Lake Ben Ouidane. Once you arrive in the center of Ouarouizagt, turn right at the round about (you will see a school).